We stayed at one of the rentals in the Pacific Grove area at Monterey. It was perfect for our needs. The rental has a great view of the Bay and the location is perfect for walking excursions and a great jumping off place for drives along the coast. We enjoyed the upstairs living and dining area, and downstairs sleeping area is comfortable and private. The kitchen is well equipped; we could make our own breakfast before taking off for days of sightseeing along the beautiful coast. During our time we had two friends stay two nights. It was easy to do, with two bedrooms and a shared bath. I'd love to come back and I can enthusiastically recommend this rental property to others. With captivating views of the Bay and Lover's Point, these oceanfront residences may be the ultimate getaway on the Monterey Peninsula! Swim, dive or kayak at Lover's Point cove across the street: with a white sand beach for sunning, a beach volleyball court, a great restaurant, a snack bar, and grassy areas for picnics, this park is a favorite of visitors and locals alike. And once you're completely relaxed? The shops and restaurants of downtown Pacific Grove are three blocks away—and Cannery Row, Fisherman’s Wharf, downtown Monterey and Carmel are just a short drive. Within minutes you can be touring scenic 17-Mile Drive, hiking to secluded Big Sur beaches, horseback riding, deep-sea fishing or whale watching. Play golf at the oceanside Pacific Grove Golf Course, affectionately known as a 'budget-minded alternative' to Pebble Beach. Or stroll along the coastal recreation trail just outside your front door and commune with seals and sea otters. The well-equipped kitchen features maple cabinetry, granite countertops, and stainless GE Profile appliances. Two televisions and a DVD player are provided, as is high speed internet access. Baths have granite vanities with a tub/shower in the master. Each unit is heated by central forced air and includes a front-loading washer and gas dryer. Carport parking behind a security gate is conveniently located near the entrances to all units. This 'townhouse style' dwelling features exterior stairs to the second level of the three-level building. The living room, dining area, kitchen and a half bath are on the entry level; two bedrooms and a full bath are downstairs at ground level. Each townhouse has a deck off of the living room that frames picture postcard views of Lover’s Point and the Monterey Bay. The coastal trail is right across the street! Lover's Point and the Beach House restaurant are right across the street. Wonderful location looking out over Lovers Point coast. Large fully equipped unit. It was everything we wanted! The location is perfect. I loved the view, and it was nice to hear the seagulls. I enjoyed my stay there. I will share that it is a small townhouse with steep stairs. (The bedrooms are located downstairs). So if you have knee problems, you may want to find something else. The unit comes with its own parking stall, but it’s tight getting into it especially if there is another car in the other space. I chose to park on the street, and discovered access to room #5 easier from the street parking. Across the street, there is a beach with kayaks to rent. Plus a large lawn area with statues. Great for a picnic or flying a kites. People were friendly and the atmosphere was upper class. There was a gorgeous coffee shop, and a lovely restaurant at that location. It was a great experience, and I would recommend staying there. This place is a gem! Excellent location - Waterfront overlooking Lover's Point. Everything was provided with great care and details; even the kitchen spices! This was out 2nd time in this place and we're planning to return again. The kids had a great time! This property is wonderful for a family due to it's proximity to Lover's Point Park (in full view right across the street). This Park was a marvel for our kids...it had everything including two beaches, a pool, snack bars, sand volleyball, a large variety of rental bikes and watercraft, and...the friendliest squirrels you have ever seen (they eat out of your hand!). The view of the Pacific Ocean from the living room was spectacular and we saw plenty of otters and seals. With queen beds in two bedrooms, there was plenty of space for a family of four. The unit was very clean and well stocked. The only drawback is that Ocean View Blvd (in front of the unit) is a bit busy and noisy during the day, but the speed limit is only 25 mph and all drivers observed the crosswalks. It is quieter during the night. One minor repair is needed to the balcony screen door...it was coming off the track quite easily. Other than that...super rental! The place was well decorated and location was great. I pay to have that ocean view every morning. The kayaks, paddleboards, and surreys are all across the street.The area was quiet at night which was perfect for light sleepers. We drove to Big Sur and back in one day. My only concern was the parking spot. It really test your driving skills especially if you neighbor has a big car. Otherwise very idyllic! Definitely recommended! The location is absolutely wonderful-- walking distance to the aquarium and directly across the street from the beach. The reason for four stars instead of five is based on small, easily remedied things: the microwave was tempermental and kept randomly turning on. I figured out how to navigate it to clear it but it is something that is probably indicative that it will need to be replaced soon. There was a mold-y smell on the way to the downstairs and mold on the shower curtain. I know that this is pretty common with all of the moisture in the air but I am wondering if some bleach could help with the shower curtain. Overall, I would stay here again simply because the location was perfect. The condo was clean, other than the mold on the shower curtain, and had everything we needed for our stay. Location, location, location. View, view, view! Spectacular location right across from Lover’s Point. It was incredible just having that view all day every day. Cannot say enough about the location and view! Walking path just across the street. All tourist locations close by and many within walking distance. Much preferred the quaint and quiet town of Pacific Grove to the more crowded Monterey areas. Condo was very clean and had everything we needed for our week’s stay. Kitchen wasn’t lacking a thing. Off street gated parking a big plus. WiFi worked perfectly. Really liked having wood floors instead of carpet. Note that the bedroom with view is on first floor at street sidewalk level so not very private. This wasn’t a big deal as most of our time was spent in the main living area on the second floor. Super easy check-in and out. No issues during our stay. Excellent communication from Monterey Rentals. Great value compared to other rentals or hotels. Did I mention the amazing LOCATION and VIEW?!?! Just book it and enjoy! We had a wonderful stay at Lover's Point 5. Plenty of room but being so close to Lover's Point meant we spent a lot of time on the balcony! So beautiful!The condo's kitchen was well-supplied with everything needed, and we cooked there a lot. We contacted the management company for some general information and they were very helpful and super friendly. We were also delighted that HBO's Big Little Lies was filming during our stay, so we had a front row seat to that as well! Love this place, and will definitely return! Nice place with a great view! The reason for 4 vs 5 stars is the housekeeper was parked in our spot and still cleaning the place when we got there at 3 pm. She was also parked in our spot on one other day during our stay, causing some frustration on where to park. One of the reasons I chose this particular place was that it came with one parking spot, so being unable to check in on time at 3pm or park in “my” spot was annoying. But thankfully there was ample street parking at the time. Our housekeeper sends her sincerest apologies for not having the unit ready on time and for parking in your spot (it won't happen again). We came to town to watch a golf tournament and this place was only a 10 minute drives to the courses. Fabulous view, clean, all the necessary supplies available and the best part, most comfortable beds ever. This place had everything we needed and more. Worked out perfectly. Definitely have this marked as a favorite and will return. We came to spend Christmas with family in the area. PROS: Great location; spectacular, unobstructed view of the bay and Lover's Point; nice layout; extremely well equipped throughout; off-street gated parking for one car; easy booking, check-in and check-out; access to the coastal walking trail and park is right across the street; walking distance around town; short drive to other area sites and attractions; friendly and helpful manager. CONS: Can't think of any! We would definitely recommend this property to everyone, any time of year. Thanks for a beautiful holiday stay! Great location. Easy to walk to stores and restaurants. Wonderful views. Kitchen was well equipped and bathroom had plenty of towels. Problem with TV in living room, very bad connection. Also recommend upgrading cable service so there would be more channels available. Also, living room furniture needs to be replaced...Very tired and dirty. We have passed your suggestions for upgrades to the owner, who is in the process of replacing the sofa. In the meantime we'll apply leather cleaner and elbow grease! We rented Lover's Point 5 for 3 nights but hope to stay longer next time. It was clean and comfortable. Nice furniture, comfortable beds and a beautiful view! Good thick towels in the bath and a great shower! Absolutely loved that it's walking distance from several quaint eateries. I recommend Red House and Holly's Lighthouse cafe. My husband walked for miles on the Monterey Bay Coastal Recreation trail every morning so if you're interested you you literally walk to the Aquarium and Cannery Row. Lover's point is a gorgeous setting we'll definitely be back to Unit 5. During our U.S visit we had stayed in many great hotels, but decided when coming to Monterey that we'd rent an apartment near the water.Our 3 night stay during June at Lover's Point 5 proved to be exactly what we needed, to just relax and take in the wonderful view's,.The apartment was spotless, and provided everything we could posssibly need to enjoy our stay. Being only about a 10-15 minute walk to the Monterey Aquarium, and short distances to other coastal walks, and the town of Pacifc Grove was a real bonus. Watching otters, seals and even whales from our living room was priceless !!!!! With supermarkets close by we able to cook our own meals, or otherwise try some of the local good restaurants. The apartment was extremely quiet, with a really comfortable bed, and furnishings.Excellent to be able to do our own laundry as well.We highly recommend this property, and would not hesitate in staying again sometime.Thanks also to Monterey Rentals for their professional and detailed service. Great condo! Super clean and the view is AMAZING! Wonderful location that is close to Carmel and Monterey. We would definitely stay in the condo again. Gated and covered parking was nice as well! We stayed in Lover's Point 5 from April 1 to 8 2017, a company of three. After visiting California and the Monterey area several times before, that was the first time we decided to rent a place for several days instead of jumping from one hotel/motel to the next. This alone already made a difference, coming 'home' in the evening. For sure, that will not be the last time I did like that. I discovered Monterey Rentals by searching the internet, I did not know them before, this was my first time booking with them. In short - it was a great experience, the communication ahead of our time in Monterey was always friendly, helpful and constructive and made me really looking forward to the visit. While there, everything was straight forward and as uncomplicated as you could wish for, so we simply could enjoy the area and the condo. Lover's Point 5 lives from the huge window and it's unobstructed view over the Monterey bay. Watching surfers in the morning while having breakfast, enjoying a glass of wine when it is getting dark over the bay (well, no sunset - but whoever is at least a little familiar with the area knows that there is no chance for sunset views in that part of PG/Monterey), just totally awesome. The condo was in perfect shape, all clean, everything was there as promised, all the equipment that I needed and tried worked just fine. The set up of the place, main entrance in the back, accessible from a private and secured parking, living room in the second floor) gives you a sense of privacy in the middle of this busy place. In brief - we had a great time in a perfect condo, thank you so much!! Nice location and unit is equipped with everything you should need during your stay.Pros:Location, views of the bay, off street parking, near walking path.Cons:Street noise starting around 5:30am, traffic, poor TV reception when using rabbit ears and even worse with the streaming SlingTV service. We're so sorry about the difficulty you encountered with TV service. We switched to Comcast cable immediately after your review. We loved staying at Lovers Point. The condo was very nice and you couldn't beat the location. It is close to the Aquarium and across the street from Lovers Point. We saw several weddings and other events from our balcony. There's a walking and bike path all along the waterfront too- a perfect place for a morning walk. It's a 2 story condo so there are stairs both up to the entrance then down to the bedrooms. The only downside for us were the beds. They were much harder than we are used to so the condo was only almost perfect. For only a few nights and that view we could put up with the hard beds. First of all, the view was amazing. Everything in the condo was great. There was nothing that was unsatisfactory at all. Only minor negative was the roadway is between this building and the coast/water - so when you're enjoying the front porch, you get lots of cars/traffic/road noise (not very peaceful). But note that ALL homes and units in this area are like that - so that's just how it is. Convenient location to all attractions. None of the bathrooms locks, fixing needed.noise travels from upstairs to downstairs. Maybe carpet @ upstairs will help to lessen the noise. We had a great vacation at Lover's Point! The condo is directly across the street from Lover's Point beach and the walking path to Cannery Row. We loved how close everything was and the condo was perfect for our family of four. The hardwood floors are very nice but with the fine sand everywhere outside and on the stairways leading into the unit, a microfiber dusting pad/mop is really needed to help protect the floors. TV selection was excellent this year along with the extra dishes and new washer, dryer. My girlfriends and I traveled down from the Bay Area for a girls weekend and were not disappointed. I've done rental units like this in the past where the pictures show great views, but when you get there it's not true. This rental did not disappoint. The view provided in the photos is exactly what you get when you are looking out of the living room window. The bay is directly across the street and there are no buildings obstructing your view. We were also very impressed by the large array of streaming networks and internet speed of the unit. With the beautiful view and TV options, it was great for us to stay in and catch up. This was a great place and I would definitely stay here again. This condo could not be located in a better spot!! Right across the street from Lover's Point, the sunset is beautiful. We rented bikes across the street and enjoyed the paths. The condo is equipped with everything you need for a comfortable stay. The owner has done many updates and is nice. Thank you for your comments - we heartily agree that the location of this property is unsurpassed, and that the property is well-equipped and comfortable. We always welcome any opportunity to improve our service, so even though you acknowledged that the minor annoyances you experienced were just that - minor - we appreciate the feedback. Our inspection records show that in addition to the two rolls of toilet tissue on the rolls, there were additional rolls stored in the bathroom cabinets. Even so, we would have been happy to have had more delivered to you. We maintain a 24-hour maintenance line so guests can request any items that are missing or in need of repair. A call to this line would also have allowed us to confirm the correct WiFi password, and we could have dispatched a technician to address the TV/cable issues. We don’t want (or expect) our guests to spend their vacation connecting routers or DVD players! Lastly, we have reviewed our directions from our office to the property and have clarified them so there is no misunderstanding for future guests. We’re happy that despite these minor issues, your overall experience was positive, and that you will visit us again. We look forward to your return! Our family of four stayed here on a recent visit to Monterey. The location is fantastic - great view, walking distance to the aquarium, cannery row, downtown. The unit was very clean when we arrived, and the kitchen was well stocked with cooking utensils, pots, dishes, etc. Also, having a washer/dryer was a huge plus. Two free passes to the aquarium saved us some money, too. There were just a few negatives for me...First, there was a very musty smell, probably due to the fact that the unit was carpeted. We opened the windows and the breeze really helped with that. Second, also related to the carpet...it was white! Not the best choice for a rental property, especially if you have kids. I was so worried about spills and dropped food. Third, the tv options were limited. There was no cable, but they had a roku set up with Netflix and a few other options. However, we didn't have much luck with that - one night it would work, the next it wouldn't. It wasn't a huge deal for us because we spent so much time out of the unit, but it would have been nice to be able to let the kids veg out to a cartoon at the end of a long day. Overall, we had a nice stay. The location can't be beat and the price was right for the amount of space you get. Excellent rental experience. The pictures are an actual 100% representation of the condo.View was stellar. Condo is two floors (bedrooms are street level and living space is upstairs). Clean, well appointed, modern. Nice building. Fabulous location. Right across the street from the Beach House restaurant, Lover's Point Beach and the recreational trail. I walked the trail every day and it was awesome. Gated parking area and laundry in the guest room. My only complaint, and it is minor,is that the mattresses were a little too hard. But I was so exhausted every night after sight seeing all day that I slept well anyway. 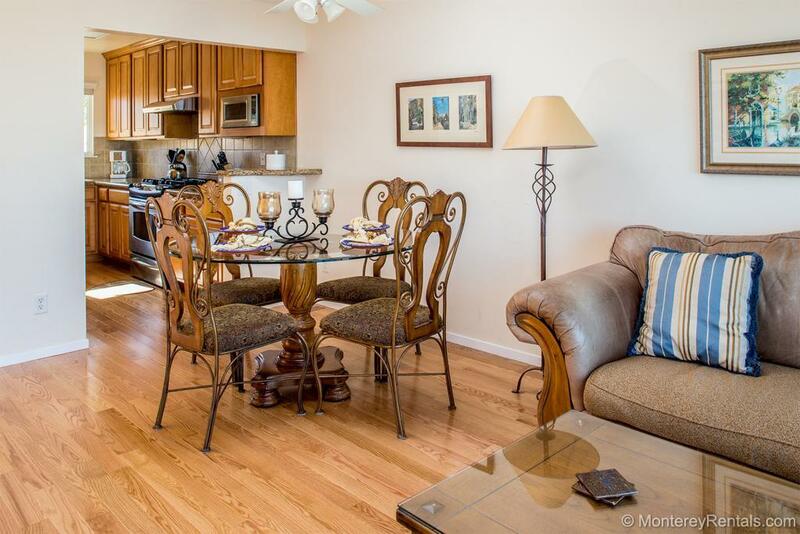 The condo is also within walking distance to downtown Pacific Grove and several good restaurants. Nice little balcony to sit and have coffee every morning or a glass of wine at night. We booked a long weekend with our 3 and 4 year old kids. The condo was perfect for our family of four. It's about a mile from Canery Row, but the bike path to get there is just steps outside the front door. It's close to 17 mile drive and across the street from Lover's Point beach. We'd definitely come back. Wonderful location overlooking the sea. The apartment was in great location overlooking the sea. It was clean and comfortable. Only things I would change is:- Improving the comfort of the beds. The beds were too hard. It would be nice to have pillow top mattresses.- We would have been less paranoid about spilling with young children if the main living area was hardwood rather than white carpet. Perfect location with outstanding views. A great condo,fully equipped kitchen, clean and spacious great location walk to downtown pacific grove. Overall a terrific vacation rental for the price. One downside: Balcony too small.